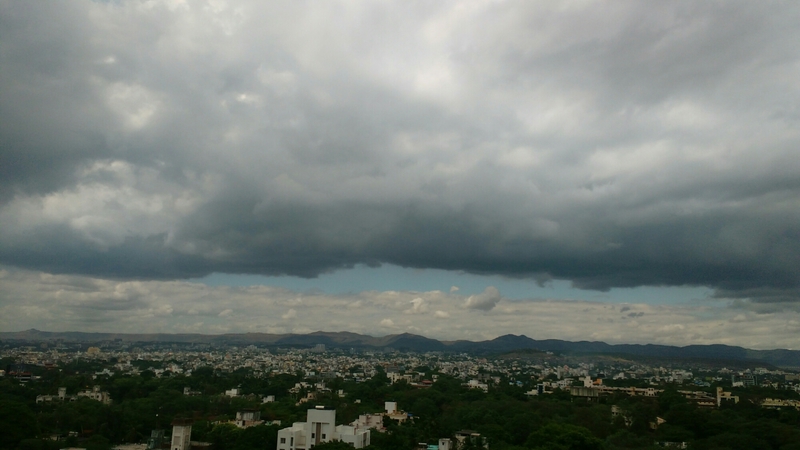 I am looking forward to a good monsoon this year. Timely monsoon is very important every year, for its failure causes undescribable agony to all the living beings. Some people, like the farmers, are directly impacted and struggle to run their day to day life. Some people, in the city, are not directly impacted for money could help for sometime. Only for sometime. But eventually they are impacted as well. Same is the case with the animals and crops. Monsoon last year was as weak as the economy. The State is completely dry and only a good monsoon this year can be a saving grace. It has already started in Kerala and will reach Pune in few days. With that said, an overcast sky makes me as happy as a peacock would be. I have mentioned earlier that my workplace has one of the best views in the town. On an overcast day like today, the view is soothing and comforting. Bring the rain on! PS: A mark of a true modern professional is to never leave any chance of tooting his/her own horn. While we are talking about monsoon and rains, I would like to shamelessly replug my 2008 post about rains here. May your write up prove right and the society be benefited. Thanks. So, can one say “Happy Monsoon” or something? Haha. I guess you can. It sounds better than a Happy Friday. “The State is completely dry and only a good monsoon this year can be a saving grace” – Amen to that.